… Keeping your gut healthy is key to helping maintaining strong immune and nervous systems. Much of the fiber in fresh pears is in the form of pectin, which has been shown to reduce cholesterol and decrease the risk of heart disease. 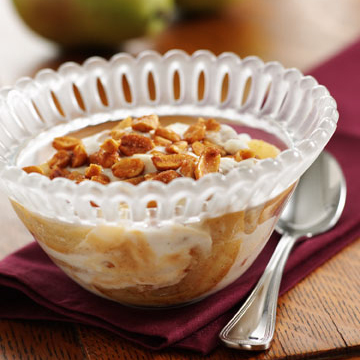 Pears contain prebiotic fiber that helps promote intestinal health by providing food for beneficial probiotic bacteria. Besides containing zero calories, fiber helps maintain healthy blood sugar levels, ensure bowel regularity, and reduce the risk of colon cancer (a disease associated with many factors)—all of which promote a healthy gut. New research led by Dr. Kalidas Shetty, Ph.D., found that the bioactive functions of pears may play a beneficial role in managing gut health. This new research looks at the health effect of pears as they are digested, such as slowing the growth of harmful bacteria (ulcer-causing H. pylori, the most common chronic bacterial infection in humans) without affecting beneficial bacteria with probiotic potential. The study also looked at pears as part of a dietary strategy to provide efficient and effective management options to combat diet-linked non-communicable diseases, like type 2 diabetes and its associated cardiovascular disease complications.